First up is Justice League, and some famous costars playing famous superpowered icons. But let’s get serious here: What was it like working with the trident? “Her name’s Bernadette,” Momoa says. We smell a spin-off! It’s golden hour at Hastings Point, a picturesque surfers’ beach 70-odd miles south of Brisbane, and Jason Momoa is getting antsy. 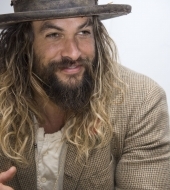 Momoa is on Australia’s east coast to film Aquaman, the $300 million fantasy flick, due out next year, in which he plays the lead opposite Nicole Kidman and Amber Heard. Until now, his most visible role has been the brutal warrior Khal Drogo on Game of Thrones. His latest film projects, though, will potentially catapult him into a different category of fame, and he’s learning that this sort of success comes with a price. 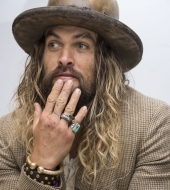 There’s no denying that Momoa is an exceptionally striking man. His mix of Hawaiian, Irish, German and Native American ancestry has endowed him with an olive complexion and green eyes. He stands 6’5” and weighs just over 230 pounds, with tousled hair, a robust beard and musculature that makes Phidias’s Zeus at Olympia look a little scrawny. And if all that wasn’t manly enough, he arrived solo at today’s shoot on a large Harley-Davidson motorcycle. What went through your mind when director Zack Snyder first approached you about playing Arthur Curry / Aquaman and reinventing this iconic Super Hero for a new generation? So, I was just standing there, kind of in shock. All I could think of was the traditional Aquaman from the comics – who is white and blond and wears the orange and green costume. I thought he had to be joking… but Zack had this look on his face. 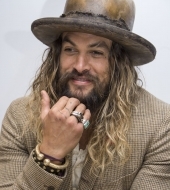 He said, ‘Hear me out,’ and told me that he wanted the Aquaman in this film to be an outsider, along the lines of Clint Eastwood’s character, the Outlaw Josey Wales. I was born in Hawaii and raised in Iowa, and basically grew up an outsider, so I could definitely identify with that. 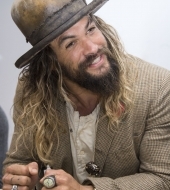 I also liked that Arthur is a half-breed – half-Atlantean and half-human – and was really interested in the idea of him being this brown-skinned Super Hero who is part of two worlds but doesn’t belong to either one. I think that’s pretty special. And me being a Hawaiian, Aquaman’s mythology also resonated with me because we have water gods in our culture – and that goes for many islands. That’s why it feels like such an honor to play this guy. How much did you know about the Justice League prior to becoming involved in the film? Were you a comic book or Super Hero fan growing up? Absolutely. I was a big comic book fan. I read a lot of different comics when I was a kid, and obviously loved Batman and Super Hero movies in general. When Tim Burton’s Batman came out, it just blew my mind; I was amazed by that film. But I hadn’t read a lot of Justice League prior to this film, so I did my research. I also had the opportunity to meet with [producer] Geoff Johns, and he’s just a wealth of knowledge about Aquaman and the entire DC universe.